You got Samsung Android device, took a few notes in Samsung Notes, then installed and signed in to the Samsung Notes Windows 10 app. Now none of your notes are showing up in the Windows 10 app. WTH is going on? Ensure you’re signed in to Samsung Cloud in both the Android and Windows 10 app. The remaining steps take place entirely in the latter. Toggle “Sync via Wi-Fi only” (the fact that a setting is literally in quotes in the app may be a red flag here) off. Toggle Sync with Samsung Cloud off and then on. The app should now sync and pull all your notes from Samsung Cloud. Users whose Windows devices are frequently between mobile and Wi-Fi data connections might want to leave the setting in #4 above enabled to save data, but pretty much everyone else should disable it. Thanks u/Act1v1si0n for this solution. If you’re reading this, you probably already know what Odin (or Odin3? Because that’s what the window title bar says) is and what it does. For the unitiated: Odin is a Samsung-internal Windows graphical utility that allows you to update Samsung Android phone storage partitions using image files from your PC. Samsung Kies does almost the same thing, but it downloads official files from Samsung only, while Odin allows the use of any image files compatible with the phone. It’s basically ADB for Samsung, but with a GUI. Because it’s an internal tool, there’s no Samsung-official download site for it. However, you should always be able to find the latest version at XDA here. Odin is a portable .exe, so you can run it from anywhere. Samsung, LG, and Sony are lying to us. Time to clear the air on a couple adoptable storage myths propagated mostly by Samsung and LG as excuses for why the feature is absent from their ROMs as shipped. I have 2 devices with adoptable storage enabled: an Nvidia Shield K1 running stock Shield software and a Samsung SM-G900V (Verizon Samsung Galaxy S5) running CM 13.0 nightly. Both OSes are based on Android 6.0.1. The feature works perfectly on both with no slowdowns or delays. Sadly, much of the confusion about the feature stems from Google’s poor communication about it to begin with. The fact that the most extensive technical writeup on the feature is a Reddit post – some of which I disagree with based on my own experience – is quite damning. Let’s start with what adoptable storage actually does. The best analog of adoptable storage in its default implementation is moving your personal files to a slower hard drive on your PC while keeping your apps on a fast SSD. That’s what adoptable storage does by default. It just changes the location of your personal files to the microSD card and reserves your phone’s eMMC or UFS storage for apps. Myth: Adoptable storage slows your phone down. Relative to keeping all your data on internal storage, this is correct. But when flagships ship with only 32 GB of storage in 2016 when even $600 laptops ship with 1TB, the assumption that users would only ever use the phone’s internal storage is anachronistic at best. Once the portable storage use case enters the picture, the speed argument falls flat because both portable storage and adoptable storage fetch user data from microSD while running apps on internal storage. Oh, and local storage will always be faster, more accessible, and more reliable than cloud storage, so comparing adoptable storage to pulling files from the cloud is also nonsensical. Myth: You lose access to your internal storage. Wrong. Rooted users can still read and write to internal storage using apps like Root Explorer, but other non-privileged apps won’t be able to do the same. Myth: You need portable storage to transfer files to PCs, and adoptable storage ruins that. How, in 2016, “experts” are recommending sneakernet for file transfer is beyond me. Popping a microSD card out of your phone to put files onto a PC makes as much sense as pulling the PC’s user data hard drive to transfer files onto another PC. The easiest way to transfer files to a PC from a phone are apps like Send Anywhere, FTP, SAMBA, or BitTorrent Sync, or hardware features such as USB OTG. There’s absolutely zero reason to insert your microSD card into your PC, especially since doing so can cause other problems. Myth: There’s no advantage to adoptable storage over portable storage. The only real disadvantage is fast(er) eMMC/UFS internal storage is no longer accessible for personal data use, but this is relevant only to users who have very small media libraries. Once your library exceeds the paltry free storage available on current 32 GB flagships, adoptable storage is the best route. Adoptable storage gives the rest of us with GBs of documents and media a gigantic (relative to internal) block of storage that any app can read or write to. Compare that to portable storage, where App A can’t modify App B’s microSD files. It also blows cloud storage out of the water in terms of speed, availability, subscription cost, and mobile data usage. Myth: microSD cards are unreliable. Adoptable storage SD cards aren’t any more or less reliable than portable storage ones. You get what you pay for. Cheap, off-brand, and low spec cards will be awful. Ensure you’re using U3 rated card at the very least. I recommend Samsung, SanDisk, and Kingston cards, in that order. I’ve had a great experience with the Samsung Micro SD Pro+ 128GB. Get it. As usual, everything that would be routine on the desktop is infinitely harder and hacky on mobile. As with previous guides, this one is more detailed version/composite of forum posts, which are linked to. The aim here is to make the process easily understandable for those who aren’t used to flashing or rooting. It applies to the Samsung SM-G900V only. Yes, you will lose root in the process. But you’ll also get your apps and data updated in-place to Lollipop and ART, thus possibly reducing the odds of CPU/battery life/heat problems later. I haven’t tried this myself, but it’s an idea. Remember to unfreeze/restore any apps you may have disabled or frozen via Titanium Backup first, or the OTA may fail. Ensure you have a 32+ GB microSD card installed. The entire update process relies on external storage, and the last thing you want is run out of space. Back up your apps and data. This guide uses Titanium Backup Pro (TBP), which is the most widely used and thus has the most community support. Unfortunately, it requires root in the first place, which means unrooted users on Lollipop will have to try an alternative such as Helium. * The basic process should still be the same, however: backup your apps and data initially, then restore your data only (if coming from KitKat, to avoid ART & Dalvik conflicts) afterwards. Ensure Auto-sync TB settings is checked. Under Backup settings, tap Backup folder location. Select (or create if one doesn’t already exist) a folder on your SD card. Tap Use the current folder to save your setting. Return to the app’s front page and tap the batch ✔ icon to the left of MENU. Under Backup, tap RUN for Backup all user apps. Tap SELECT ALL. If you have Microsoft Office installed, uncheck it. For some reason TBP chokes when attempting to restore data for it, so just omit it. Ensure the Pause active apps radio button is engaged. This will ensure all your apps get backed up even if they’re currently running. Tap the ✔ icon and wait for the backup process to complete. It may take a while depending on how many apps you have, so be patient. When that process completes, head to Phase 1. Download G900V_OC4_100%_Stock_Rooted_ROM.zip to the top level directory of your SD card. A top level location makes the file easier to find in Safestrap, whose UI is extremely basic. Download Safestrap-G900V-3.75-KitKat.apk to your SD card. If you’re on Lollipop, proceed to Phase 2. If you’re on KitKat, proceed to Phase 3. Follow the HOW DO I INSTALL SAFESTRAP? instructions here. Upon booting into Lollipop, the OS will ask if you’d like to restore your apps from your previous device. Accept the offer. Note that this will NOT restore the data associated with these apps, despite the prompt’s claim. You’ll do actual data restoration in a later phase. If you’re on a metered data plan, be sure to connect to Wi-Fi as soon as you can to prevent your data being used for app downloads. Wait for the reinstallation process to complete. Set TBP’s backup folder to be the same one you selected in Phase 0 above. This should load not only the backups you made but your previous settings also. Under Restore, tap RUN for Restore all apps with data. Ensure the Data only radio button is engaged. Ensure Exclude system APKs is checked. Tap the ✔ icon and wait for the restore process to complete. Note that some system apps, such as Smart Remote, won’t be restored and so you’ll have to set them up from scratch instead. If you are coming from rooted KitKat originally, I would not suggest you try to restore them either as they could have been under the hood changes that may not play well with the restored data. This isn’t absolutely necessary, but it’s useful in case you have CPU usage/battery drain/heat issues after the update. Follow these instructions. * Having never used Helium before, I can’t provide or verify any instructions for it. Sorry. 802.11n can combine two 20 MHz channels to form an effective bandwidth of 40 MHz. 40 MHz enables higher data transmission rates to be achieved as compared to 20 MHz. When you select 20/40 MHz mode, the router decide to use 20 or 40 MHz based on the interference/contention the router detected. Care should be taken when using 40MHz mode, the legacy client may not be connected to the router. However, when using a wider channel bandwidth, there are fewer channels available for other devices, making more interference/contention with neighboring WLANs due to increasing overlap. In order to avoid excessive interference, the Wi-Fi Alliance develops an advice: setting 20 MHz in 2.4GHz as default. 40MHz is still appropriate for some situations, e.g. in a warehouse, but we do not recommend that using 40MHz in the 2.4GHz band for dense residential areas. I enabled it anyway, and noticed my Galaxy Nexus frequently being unable to access the internet despite being connected to the router. Switching back to 20 MHz solved the problem. Given the Galaxy Nexus’ release date, apparently “legacy” for ASUS means anything from late 2011 or preceding. For the record, the phone’s Wi-Fi radio is the Broadcom BCM4330XB2KFFBG. Broadcom radios have been suspect recently, so this isn’t surprising. And yes, I know ASUS recommends 20/40 MHz not be used for residential settings, but my Dell Precision M4600, Amazon Kindle Paperwhite, and Sony Vaio Fit 15 E all handled it without complaint. 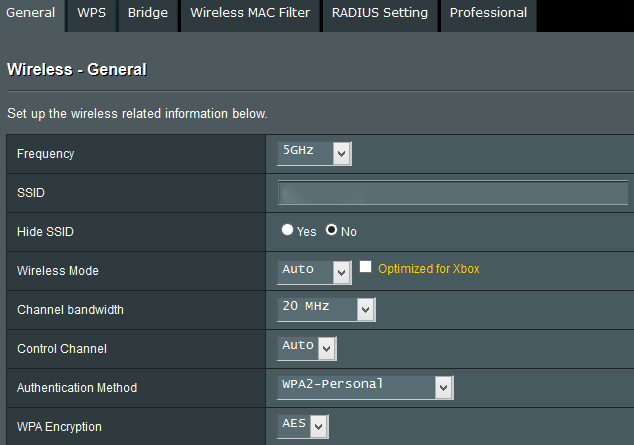 UPDATE: Also, disable “b/g protection” for 2.4 GHz frequency. Then, forget the network on the Galaxy Nexus and then reconnect to it.